CHASING THE RED CAR is a new novel by Ellen Ruderman that sheds light on the lingering effects of Communist Witch Hunts of the late 1940s and early 1950s. It is also the story of a family and the coming of age of young heroine Kim Lebow, struggling to follow her dreams and beliefs in a repressive political climate that reaches into every aspect of her daily life. On Kim's journey, The Red Car represents a symbol of freedom and liberation for her. Freedom from the boredom of hot Valley summers - liberation from a distressing family environment which she could leave behind as she rides the Red Car over the Cahuenga Pass to the excitement on the other side of the hill. 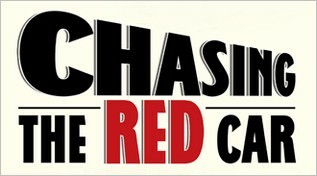 CHASING THE RED CAR draws parallels between the political repression of the 1950s and the abuses of executive power after 9/11, reminding us that all politics is personal and that the truth of George Santayana's maxim about history repeating itself can be seen all around us every day.